November 11 is the traditional day when Canadians stop to reflect on the sacrifice of the men and women who gave their lives in the name of freedom. But our campus also has daily reminders of their valour and loss. A new photo exhibition, currently on display in the main floor lobby of the James Administration Building, tells the story of how the McGill community’s aching need to remember the First World War forever marked our campuses. 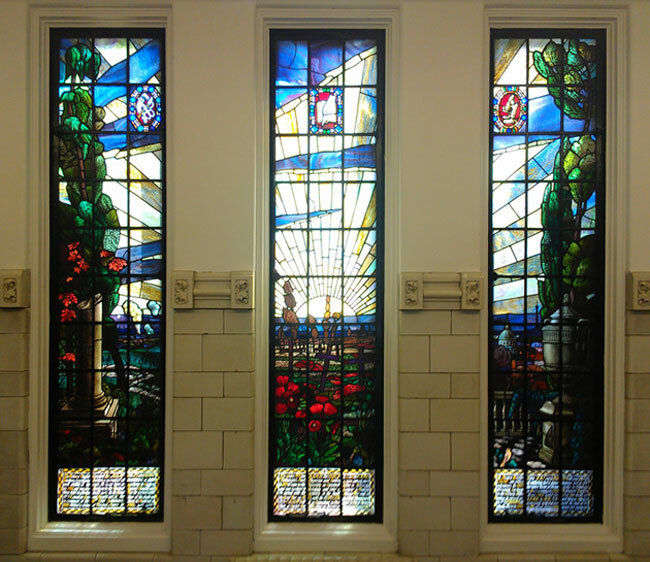 The three panes of a stained glass window in the Strathcona Building commemorate three McGill professors who lost their lives in the Great War including Dr. John McCrae, the author of the iconic poem In Flanders Fields. Remembrance takes many forms. It can be a tradition, such as the annual two minutes of silent, solemn reflection that marks the armistice that ended the First World War. It can be a small but emotionally potent artifact, such as the illuminated book listing the names of McGill’s fallen, which has a place of honour in the walkway connecting the McLennan and Redpath Library Buildings. Remembrance can also entail grand monuments, whose large scope echoes the depth of gratitude felt for the sacrifice made by so many. A new photo exhibition, currently on display in the main floor lobby of the James Administration Building on the downtown campus, explores how the aching need to remember the First World War physically changed McGill. “Through Tragedy We Transform: The Metamorphosis of the McGill University Campus in the Aftermath of the Great War (1914-1918)” collects 13 photos showing ways in which the McGill community created large, permanent reminders of valour and loss. The Visual Arts Collection created the exhibition, with support from McGill Associates, Friends of McGill and the McGill Remembers project. Kinny Kreiswirth of McGill Graphic Design designed the display. “Seen together, they inspire us to honour past McGillians who sacrificed their lives to the war effort,” says art history student Hayley Eaves, who researched and wrote the exhibition during a summer internship in the Visual Arts Collection. “It’s an effort that very much remains marked in the history of our University.” Eaves finished her BA this past spring, and is currently an MA candidate and the 2016-17 Max Stern Fellow. Eaves spent weeks pouring through hundreds of drawings, architectural plans, photographs and archival documents. The challenge, she says, was to distill this wealth of materials into a narrative that could fit into a few display cases – and give pause to passersby. What emerged is a story of creativity and growth in the face of unspeakable loss. Out of a tragedy that took the lives of more than 60,000 Canadians – including 400 McGill students, faculty and staff – came visually stunning reminders such as the stained glass window in the Strathcona Dentistry & Anatomy Building and the War Memorial Archway in the Raymond Building on the Macdonald campus. 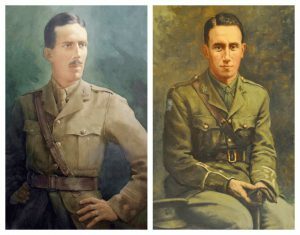 The exhibition also tells the stories of three McGillians, all killed in the line of duty, whose legacies remain vital parts of daily campus life: Lieutenant George Irvine Baillie, Lieutenant Gordon Home Blackader and Captain Percival Molson, whose memories live on through, respectively, the chemistry library, the art and architecture library, and the football stadium. On Thursday, November 17 at noon, the Visual Arts Collection and McGill Remembers will host a discussion about “Through Tragedy We Transform: The Metamorphosis of the McGill University Campus in the Aftermath of the Great War (1914-1918)” in the lobby of the James Administration Building. The exhibition will be on display until early 2017. Wonderful piece of research to educate others…I never knew this but then of course :we would have these heroes.! Thank you VAC for highlighting this aspect of McGill. Everyone matters!